Fritatta with vegetables is easier than omelets when you want to prepare breakfast or brunch for the family. 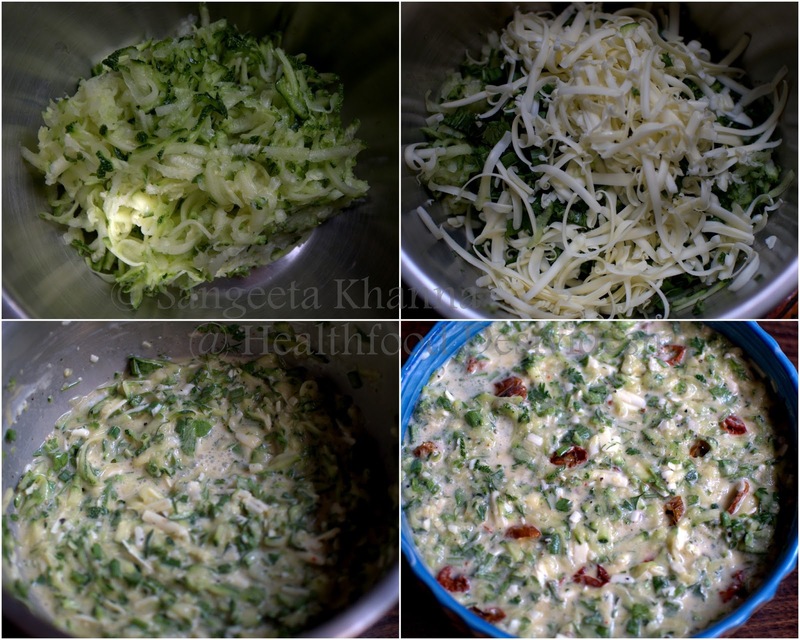 Adding vegetables like zucchini and broccoli or spinach makes it easier as you don't have to scrub clean or peel the vegetables, just grate or chop roughly and you are set for great tasting breakfast with the flavors of the day. Flavors of the day play a great role on shaping up your mood for the day as well, the fresh seasonal vegetables, any herbs you feel like and any cheese of your choice. You could add some dry fruits or vegetables if you wish. May be some pickled vegetables as well. Mix everything up, pour in a greased round dish and bake in preheated oven at 180 C for about 20 minutes. The diameter of the baking dish would be important to decide baking time. 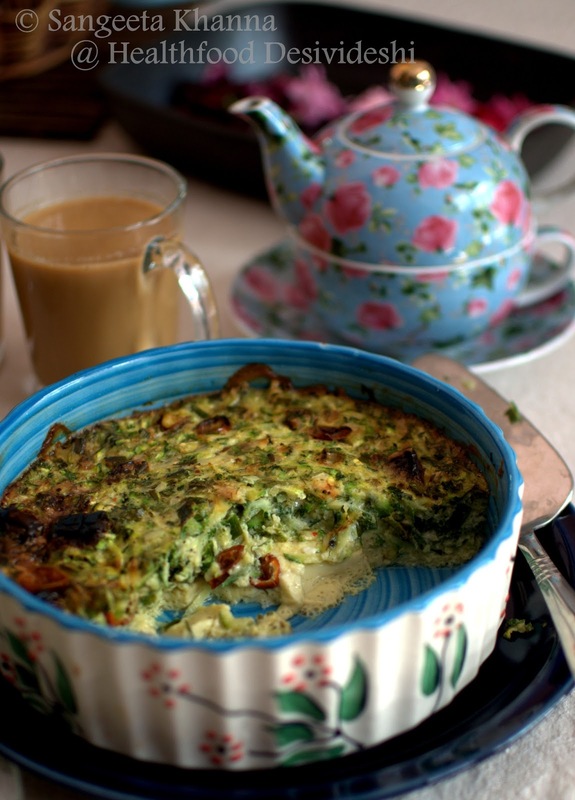 Mine was a 19 cm diameter baking dish and the frittata was a good 2.5 cm thickness. 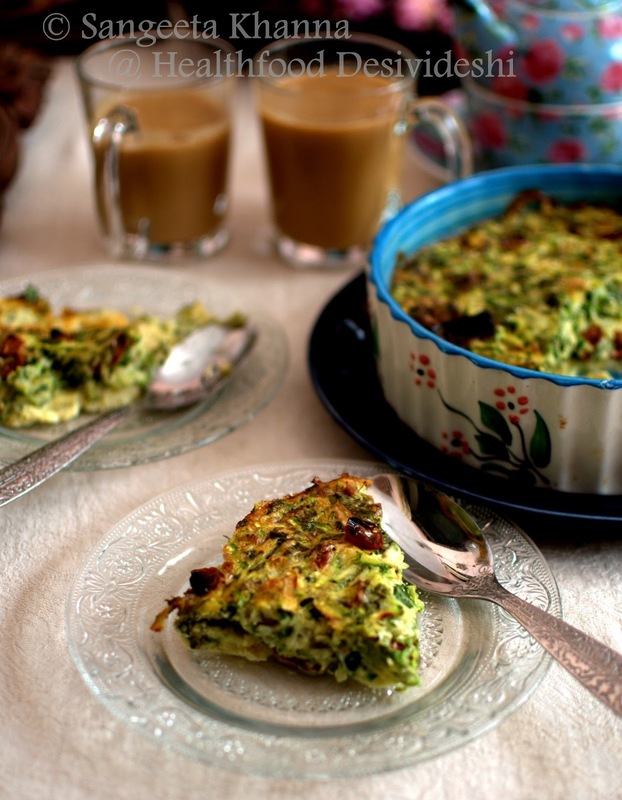 Pricking in the middle and checking if completely done will be a good idea to have an idea of you want it to be a firm frittata. The zucchini has a lot of moisture and the frittata will be quite moist inside. 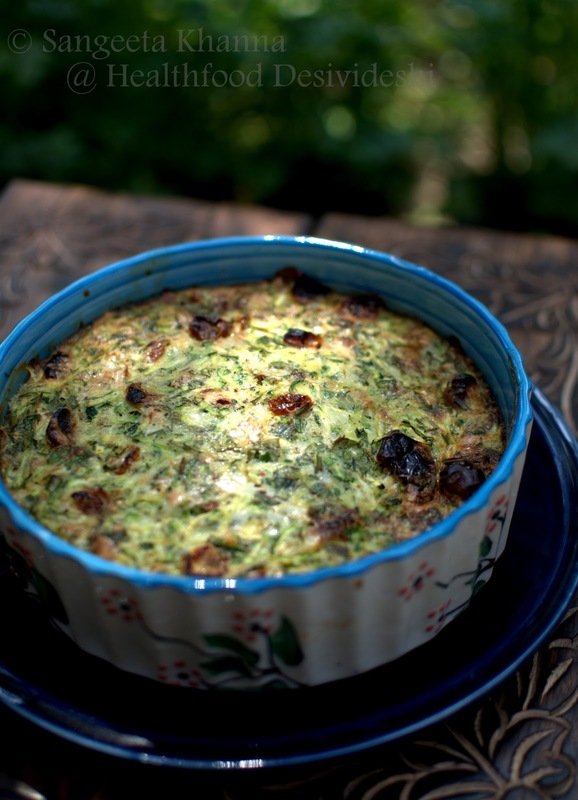 The cheesy flavors melding with the tart sun dried cheri tomatoes will be great fun to be in a soft melting type frittata. A nice springtime Sunday brunch in the garden with some milky masala tea. We had a large slice as leftover too between the two of us. 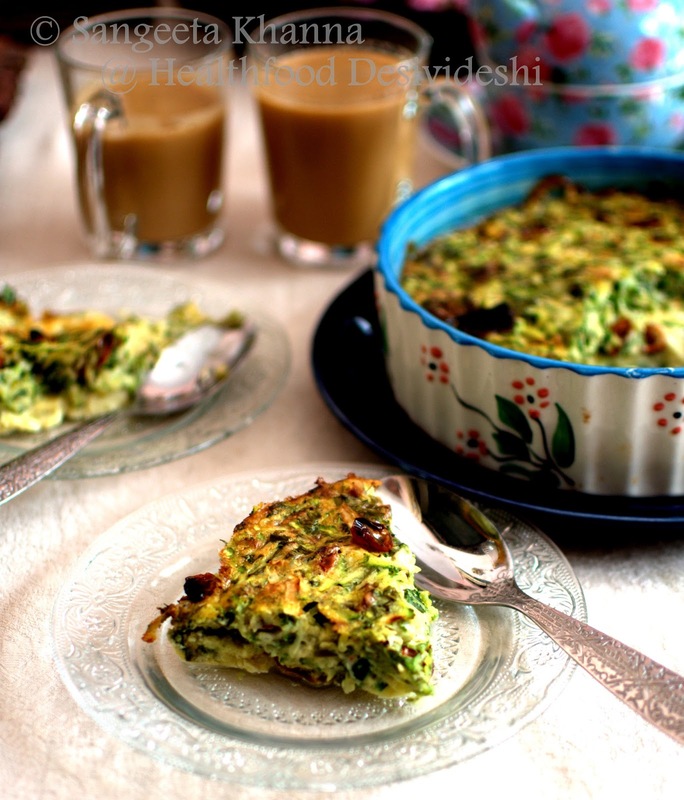 This frittata is quite filling and keeps you full till the evening. 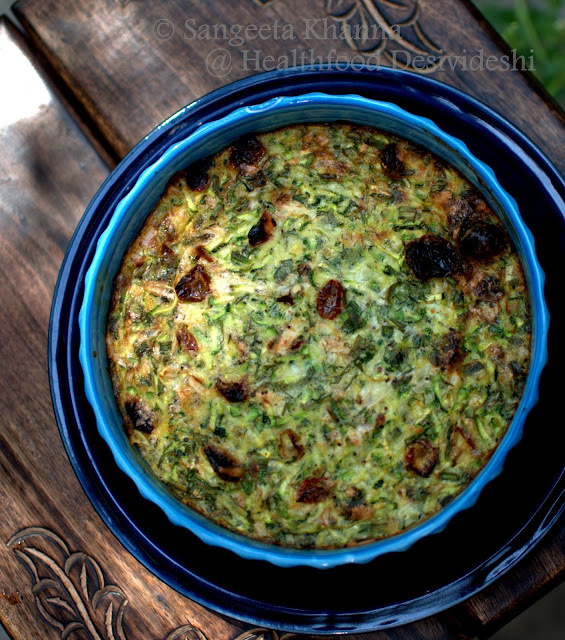 Rich flavors or herbs, cheese and sun dried tomatoes will make you repeat this frittata over and over again. Use broccoli or cauliflowers if you don't like zucchini much and replace sun dried cheri tomatoes with thinly sliced fresh tomatoes arranged on top if you haven't sun dried some tomatoes on your own. They are available in markets and I suggest using the dry variety not the oil preserved to get the rich taste they have. I keep my sun dried cheri tomatoes refrigerated for the whole year and use them with various flavors.. So filling and so yum. Must make this for brunch!! Soo trying this! Every one of these ingredients is a favourite at home, how can the dish not be!